At this time of year, the name of Charles Dickens is never far from many people's minds. His timeless classic 'A Christmas Carol' is as much a part of the holiday tradition as Santa Claus or eating too much turkey, and has been re-told countless times around the world. But it was two of his other books that caught the attention of collectors, last week, as a couple of very rare signed first editions turned up at auction. 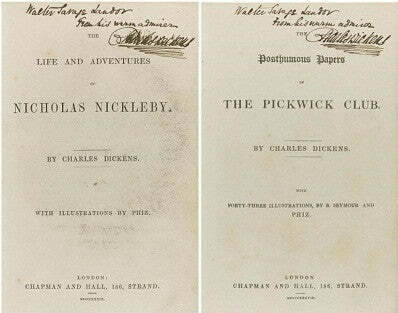 The sale at Sothebys' in London on December 16 featured first-edition copies of 'The Posthumous Papers of the Pickwick Club' and 'The Life and Adventures of Nicholas Nickleby', both signed by Dickens and inscribed to his friend Walter Savage Landor. Landor was a poet and writer famed for his eccentric nature, and Dickens immortalised him as the character Lawrence Boythorn in his novel 'Bleak House'. Both books were given to Landor in 1840 and inscribed "From his warm admirer Charles Dickens." Both books had a pre-sale estimate of £30,000 - £50,000, but when the hammer went down each had sold for an impressive £67,250 (including buyer's premium). Dickens' signature has proven highly sought-after with collectors in recent times, and the value of his autograph has risen by 396.9% in the last 10 years (according to the industry's PFC40 Autographs Index). A rare letter hand-written by Dickens is currently available on the market for £2,950, and is certain to appreciate in value over time. Dickens work has remained so popular over the years that the majority of his books have stayed in print for over 160 years. Indeed, his popularity is such that one website is even offering samples of his hair for sale as a truly unique investment. It seems Dickens' appeal for collectors could be as timeless as his stories, and as long as his books are read around the world there will always be value in his memorabilia.